The cloud experts at Manhattan Tech Support will help you achieve great flexibility and efficiency while ensuring the safety and security of your cloud initiative. We will set up a reliable and fast cloud infrastructure that will increase your efficiency and profitability. With Cloud computing from ManhattanTechSupport.com, using, upgrading and maintaining your IT has never been simpler. Your technology, software, and applications are hosted by our team of experts, which means you can eliminate the cost of investing in new infrastructure, licensing new software and training new employees – saving you money and letting you focus on your business. Cloud Services from Manhattan Tech Support let you harness the power of your office intranet and Internet to increase efficiency, enhance communication, inspire collaboration and simplify teamwork. Your technology can grow as your business does. Built around your specific business needs. Get access from your mobile device. Cost-effective technology pays for itself. You need advanced software to run your business, but the high cost of purchasing, licensing, and hosting your own applications can force you to make compromises. With hosted solutions from Manhattan Tech Support, we host the software and applications for you, so you can avoid the high upfront costs, management and ongoing maintenance of the IT infrastructure you depend on each and every day. 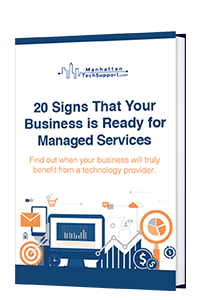 Discover what Hosted Solutions from Manhattan Tech Support can do for your business. With Hosted Solutions, Manhattan Tech Support manages your applications and the hardware infrastructure required to run them, taking care of connectivity, repairs, updates, and maintenance so that there is no impact on in-house IT resources. Our Web design services include everything from site development and planning to execution, maintenance and hosting, so you can get your business online. Improve communications with business e-mail and collaboration tools including shared calendars, tasks, contacts, public folders, and e-mail. For mobile use, add on Android devices, iPhone or Windows Mobile devices - for one low price. Web and mobile application hosting and tailor-made service and support for your specific business requirements. While your company depends on email as a tool for communication and storing large quantities of critical business data, it can also be a real threat. With online attacks becoming more and more prevalent, including SPAM, phishing, viruses, and malware, protecting yourself is no longer an option – it’s an absolute must. By offloading huge storage needs from your server. Prevent viruses, SPAM, worms and other online threats. With complete email indexing and easy access to your critical records. With flexible search options and attachment & message archiving. Manhattan Tech Support can provide strategic solutions to ensure your email is an asset that works toward the success of your company, instead of creating security problems that could affect your business and your bottom line. These powerful solutions can be designed to meet the unique requirements of your company. If you could benefit from increased market share, greater efficiency or a better bottom line, Cloud Services from Manhattan Tech Support is the answer. Get started with Cloud Services from ManhattanTechSupport.com today!